BACKGROUND AND PURPOSE: Carotidynia is an idiopathic neck pain syndrome associated with tenderness to palpation over the carotid bifurcation. Although well known in the otolaryngology and neurology literature, the validity of the entity has recently been questioned, in part because of the almost uniform absence of radiologic or pathologic findings. We report the MR findings in five patients with carotidynia. 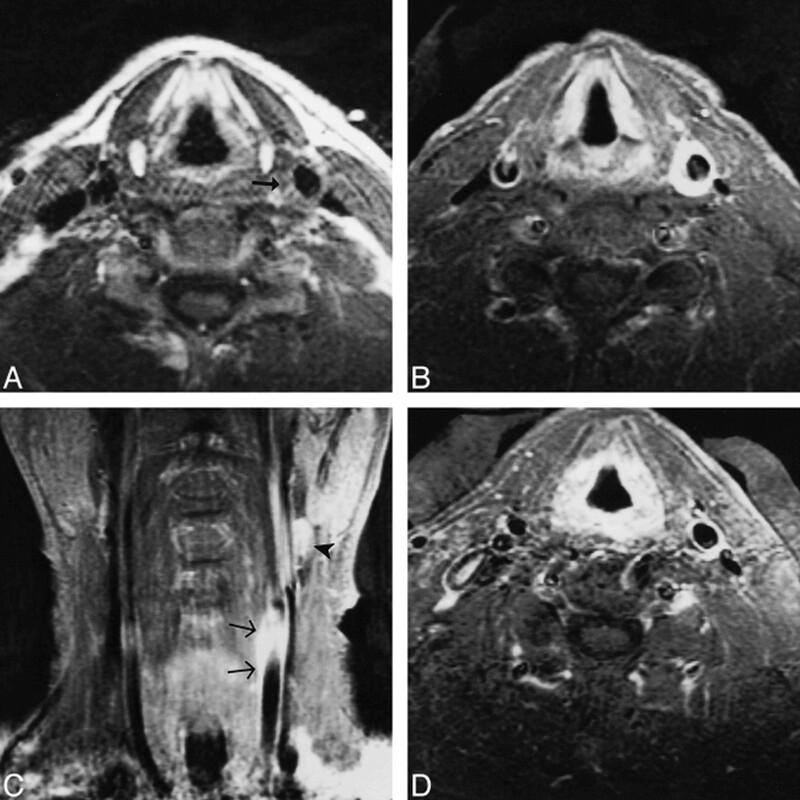 METHODS: During a period of 44 months, five patients with clinical signs and symptoms consistent with carotidynia were referred for imaging from the otolaryngology service. Each patient underwent MR imaging of the neck on a 1.5-T system. The studies included, as a minimum, pre- and postcontrast axial and postcontrast coronal T1-weighted images. Two patients also had axial T2-weighted imaging and another two patients underwent duplex sonography of the carotids. RESULTS: All five patients had abnormal enhancing tissue surrounding the symptomatic carotid artery centered at the level of the distal common carotid and carotid bifurcation. This tissue had intermediate signal intensity on T1-weighted images and showed marked enhancement. In all patients, the remaining visualized portions of the carotid artery were normal. Normal flow voids were present throughout the vessel, and the caliber of the vessels was always within normal limits. There was no evidence of intramural hematoma, cervical lymphadenopathy, or atherosclerotic disease of the vessel. In one patient, repeat imaging after resolution of symptoms showed an absence of the previous abnormality. CONCLUSION: The MR findings in these patients, along with the lack of any findings to suggest alternative diagnoses, support the existence of carotidynia as a distinct clinical entity. Carotidynia is an idiopathic neck pain syndrome associated with tenderness to palpation over the carotid bifurcation. The syndrome was initially described by Fay (1) in 1927 and since then has been the subject of numerous reports in the otolaryngology and neurology literature, some including hundreds of patients (1–6). Nevertheless, with the exception of a single case report in 1997 (7), there have been no reports describing the imaging findings of carotidynia. We report the MR findings in five patients with carotidynia. During a period of 44 months, five patients (three women and two men, ages 26–51 years) with clinical signs and symptoms consistent with carotidynia were referred for imaging from the otolaryngology service. Each of the patients met the clinical criteria established for the diagnosis of carotidynia by the International Headache Society (IHS) Classification Committee (8) (Table 1). All patients underwent MR imaging of the neck on a 1.5-T system equipped with an anterior neck coil. The studies included, as a minimum, pre- and postcontrast axial and postcontrast coronal T1-weighted images. Two of the patients were also imaged with an axial T2-weighted sequence. In addition, two of the patients underwent duplex sonography of the carotids. All five patients had abnormal enhancing tissue surrounding the symptomatic carotid artery centered at the level of the distal common carotid and carotid bifurcation (Figs 1–3). The findings are summarized in Table 2. In four of the five patients, the degree of enhancement was striking, with the enhancing rim of tissue measuring 6 to 8 mm thick. The length of the enhancing segment varied from 1.5 to 3.5 cm, and always included the distal common carotid as well as varying portions of the carotid bulb. In each case, the distribution of the enhancing tissue appeared to conform to the fascial borders of the carotid sheath. In all patients, the remaining visisible portions of the carotid artery were normal. In each case, normal flow voids were present throughout the carotid, and the caliber of the vessel was always within normal limits. There was no evidence in any case of intramural hematoma, cervical lymphadenopathy, or atherosclerotic disease of the vessel. Fig 1. 48-year-old man with left-sided carotidynia. A, Axial T1-weighted image (700/16/2 [TR/TE/excitations]) at the level of the distal common carotid artery. A skin marker has been placed over the area of swelling and tenderness. Note the abnormal soft-tissue signal surrounding the left carotid (arrow). B, Axial contrast-enhanced T1-weighted image (550/16/2) shows striking enhancement of the tissue surrounding the artery. C, Coronal contrast-enhanced T1-weighted image (550/16/2) shows the enhancement extending to the level of the carotid bifurcation (arrows). A lymph node is seen above the bifurcation (arrowhead). D, Axial contrast-enhanced T1-weighted image (500/12/2) obtained several months later, while the patient remained asymptomatic, shows resolution of the thick rim of enhancement. Fig 2. 31-year-old woman with right-sided carotidynia. A, Axial T1-weighted image (700/11/2) at the level of the distal common carotid artery shows abnormal soft-tissue signal surrounding the carotid (arrows). The carotid itself is normal in contour and caliber. B, Axial contrast-enhanced T1-weighted image at the same level shows marked enhancement of the tissue surrounding the vessel. Note the smooth margins of the enhancement as it extends toward the internal jugular vein, suggesting conformance to the fascial borders of the carotid sheath. Fig 3. 51-year-old woman with left-sided carotidynia. A, Axial T1-weighted image (560/15/2) at the level of the distal common carotid artery shows abnormal soft-tissue signal between the carotid and internal jugular vein (arrow). B, Axial contrast-enhanced T1-weighted image (580/15/2) shows marked enhancement of the abnormal tissue. Note again how the smooth margins of the enhancement extend toward the internal jugular vein, in conformance with the expected borders of the carotid sheath. In one of the patients, in whom an axial T2-weighted sequence was obtained, subtle increased signal intensity tissue was noted in the region of postcontrast enhancement. In the second case, the T2-weighted sequence was affected by fat saturation failure, and the abnormal tissue surrounding the carotid showed very low signal intensity that was essentially indistinguishable from the adjacent carotid flow void. Findings at duplex sonography of the carotids were normal in the two patients in whom this technique was performed. These examinations, however, were directed at the carotid lumen and blood flow characteristics, and only representative Doppler waveform images of the studies were available for review by the authors. Four of the five patients were treated with nonsteroidal antiinflammatory drugs (NSAIDs), with prompt and complete relief of symptoms within a few days. Owing to an allergy to NSAIDs, the remaining patient was closely observed, and symptoms resolved spontaneously over a 10-day period. This patient underwent follow-up MR imaging while asymptomatic, which showed resolution of the previous finding (Fig 1D). Although the IHS established criteria for the diagnosis of idiopathic carotidynia in 1988 (Table 1), considerable controversy persists in the medical literature regarding the entity. Although some authors think that the condition is underdiagnosed (5, 6, 9), others maintain that it does not even exist (10). Much of the confusion arises from the use of the term carotidynia by different authors to refer to either the idiopathic disease recognized by the IHS or only to the symptom of pain arising in or around the carotid artery. The authors of two recent articles use the latter definition, referring to carotidynia as a symptom that may result from a variety of vascular and nonvascular causes rather than a distinct disease of implied carotid origin (11, 12). In another recent critical review titled “The Myth of Carotidynia,” Biousse and Bousser maintain that carotidynia is a “non-validated entity,” and conclude that “carotidynia is a misleading term that should be preferably expunged from the medical nosology” (10). As support for this position, these authors cite the frequent lack of diagnostic studies in previous reports of carotidynia that might have yielded findings supporting alternative diagnoses as the cause of the patients' symptoms. Indeed, very few reports in the literature have included imaging studies of any kind, and these have generally been limited to angiography or sonography (6, 13–16). In establishing criteria for the diagnosis of carotidynia, the IHS committee noted that “organic disease of the carotid artery may cause a similar picture and appropriate investigation should rule out conditions such as giant cell arteritis, atherosclerosis, thrombosis, intraluminal hemorrhage, fibromuscular dysplasia, aneurysm, and aneurysmal dissection” (8). Certainly, the list of differential diagnostic possibilities for unilateral neck pain is long, with the more common conditions including these conditions as well as lymphadenitis, degenerative joint disease of the cervical spine, and submandibular gland disease. Most of these conditions can be excluded by a careful history and physical examination. Further appropriate investigations, although not specified by the IHS committee, would include sonography, angiography, and MR imaging. The clinical presentation and MR findings of the five patients in this series are consistent with inflammation within the carotid sheath, including perhaps the adventitia of the carotid artery. The inflammatory nature of carotidynia is also supported by the usual positive response to therapy with NSAIDs or corticosteroids; however, no pathologic studies of idiopathic carotidynia have been reported, probably because of the typical benign course of the disease and the obvious hazards associated with biopsy or resection of the carotid artery. Although some authors have referred to the condition as carotid arteritis (9, 17, 18), the lack of narrowing of the lumen or irregularity of the vessel wall suggests sparing of the media and intima of the vessel. The diagnosis of carotidynia can usually be made on clinical grounds, including a complete history and careful head and neck examination. Selected laboratory tests, such as a complete blood count and erythrocyte sedimentation rate, may be helpful. Prompt response to NSAIDs, or a short course of corticosteroids, is generally confirmatory of the diagnosis. In those patients in whom the diagnosis is not clear, imaging may be warranted. In such cases, we recommend MR imaging as the most appropriate examination. Our current protocol for suspected idiopathic carotidynia includes precontrast axial and coronal T1-weighted sequences, a precontrast axial T1-weighted sequence with fat saturation (the fat saturation sequence is included to optimize detection of carotid dissection, an important consideration in the differential diagnosis of carotidynia), an axial T2-weighted sequence, and postcontrast T1-weighted axial and coronal sequences with fat saturation. For patients in whom atherosclerotic disease figures prominently in the differential diagnosis, a time-of-flight cervical MR angiographic sequence is added to the examination. The MR findings of the five patients in this report, including the abnormal enhancing tissue centered at the carotid artery within the carotid sheath, as well as the lack of any findings to suggest alternative diagnoses, strongly support the existence of carotidynia as a distinct clinical entity. Our findings also show that in the appropriate clinical setting, MR imaging may be helpful in the evaluation of patients with suspected carotidynia. In such patients the presence of localized enhancing tissue surrounding the symptomatic carotid artery and confined by the carotid sheath is supportive of the diagnosis. In addition, MR imaging enables the evaluation of most of the common entities in the differential diagnosis of carotidynia, including lymphadenitis, submandibular gland disease, head and neck tumors, and carotid dissection. 1 Presented in part at the annual meeting of the American Society of Neuroradiology, Toronto, May 1997. ↵2 Address reprint requests to Bradford S. Burton, MD, LTC, MC, Department of Radiology, Tripler Army Medical Center, Honolulu, HI 96859. Accepted after revision November 8, 1999.